This week I was reminded why I decided to go into teaching. And no, it wasn’t some fulfilling teachable moment I had with a student or the epiphanic stare that tends to follow a windfall of understanding in a 13-year-old’s eyes. It was much more selfish than that. I got to take a chart-topping pop song that many of my kids could sing, and open the curtain on the double-meaning of the lyrics. Of course most of their brains aren’t developed enough to grasp the deeper concepts of life so it was more like me talking to the blank stares that follow a windfall of confusion. In 2013, British indie rock band Bastille released “Pompeii” which reached #5 on the Billboard Hot 100 chart. It has a great beat, but few young listeners know about the event that inspired the song—the 79 A.D. eruption of Mt. Vesuvius and the subsequent destruction of the city of Pompeii, Italy. The earth had been quaking and smoke emanating from the 4200-foot peak for weeks before the eruption. Many of the 20,000 residents took the warning and high-tailed it out of Dodge, but more than 2,000 chose to ignore it. They were the ones that were enveloped in the 1300°F avalanche that surged down the mountain at 70 MPH and covered the valley with 16 feet of ash and pumice. Pompeii was literally wiped from the map. Seventeen hundred years later (in 1748) excavators started uncovering the city and discovered gaping hollows in the dig site. To determine what the gaps were, they drilled small hole and poured cement inside the spaces and realized they were human-shaped shrouds of the cremated victims of Mt. 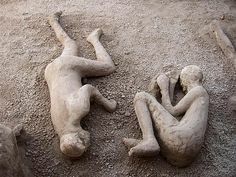 Vesuvius, frozen forever in their individual poses of death. Two of these plaster mannequins are the stars of Bastille’s song. “What kind of conversation would two of these corpses have with each other if they could talk?” hypothesized singer-songwriter Dan Smith. Relating to a time in his own life when he was trapped in a dead-end job, Smith croons about the stasis that many people feel in their own lives as perpetrators and victims of pain and heartache. The bridge of the song is the most insightful—okay, we’re aware of our frozen state, now what do we do? Focus on the rubble or destruction the sin caused or do we the deal with the root of problem—our sinful hearts? As a co-dependent, I analyze everything to death and therefore could spend my life examining every square inch of the rubble that my sin (or others) has caused. But to what end? The apostle Paul said it best: “Forgetting what is behind and straining toward what is ahead, I press on toward the goal to win the prize for which God has called me heavenward in Christ Jesus” (Phil 3:13-14). Not sure if Mr. Smith is a Bible-student, but if not, he unwittingly gave me a vivid image–sin has rolled over us all like a gray cloud of ash smothering us in its wake. And I’m dead in it, as dead as the victims of Vesuvius. –or I can I learn from my past messes, try not to screw up quite as bad the next time, and let the sacrifice of the Cross break the chains of bitterness so I can forgive my tormentors and my heart can heal. You hung around long enough to learn something, didn’t you? Well, there you go.